Bed mites are the cause of many allergy and asthma problems particularly among children. While it is relatively easier to wash and dry bedsheets, the mattresses are another matter. Carpets, upholstery, sofa, bed paddings and pet areas are other notoriously difficult to clean areas which promote the growth of germs, bacteria, viruses and other invisible microorganisms. Yet the battle is not totally lost. 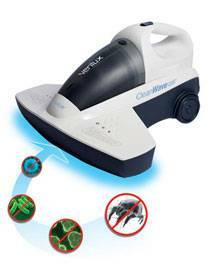 CleanWave Sanitizing Vacuum is an anti-allergenic UVC Sanitizing Vacuum that makes use of ultraviolet technology to eliminate dust mites, bacteria, fleas, and other allergens. More importantly, it penetrates the cell membranes of the microorganisms and destroys the DNA, thus preventing the microorganisms’ further breeding on the particular surfaces. CleanWave also deploys a stage 2 micro-allergy filtration system which prevents the pollutants captured from recirculating. Featuring a bagless design and 400-watt powered suction, CleanWave deodorizes and sanitizes without causing damage to fabric or leaving harmful chemical traces. A detachable hand design makes cleaning so easy as well as enables users to clean hard to reach nooks and crannies. Tests show that CleanWave Sanitizing Vacuum destroys 99.9% of pollutants including the H1N1 virus fast and effectively. Notwithstanding its size and look, CleanWave proves a lethal weapon in battle.